Tracking Wounded Deer – When is the right time? 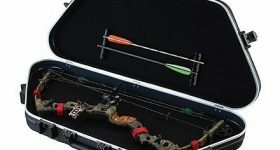 If you are an experienced bow hunter you will recognise that knowing how to track wounded deer is of equal importance to knowing how to shoot them. Pickabow has put together some tips that will make your tracking easier. Hunting deer with a bow gets easier if you follow these tips. Learn how wind, scent, timing and noise may affect the outcome of your hunting expeditions. Did you know that physics play a huge role in your shooting performance? Use Mechanical Advantage Formula to your advantage, for bigger arrow penetration.